I loved our Monona home. A nice, central location not far from downtown Madison. A proper 105' x 95' lot. Fantastic neighbors. Cool mid-century modern style. I could go on and on. 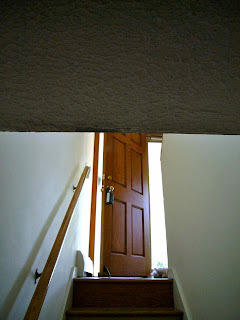 But for all of the house's strengths, one thing that perpetually bothered me was the basement stairway. Not the fact that the stairs themselves were overdue for a refinishing (one of the few remaining things on my to do list prior to us moving), but the fact that the house's architect seemed to fail in considering that someone over about 5'5" would ever reside here. There simply wasn't enough headroom clearance for anyone of even average height - and I'm 6'1". Not sure how this slipped by the inspectors back in 1963 - maybe the builder slipped a little something in an inspector-bound envelope to overlook this. The first month or two was brutal on my cranium, but soon I found myself automatically listing my head to a 45 degree angle in order to clear the textured ceiling. Every guest who ventured down the stairs had to be told to watch the clearance. But still, every few months I'd end up crashing skull to plaster if I was doing something slightly out of the ordinary on the stairway - such as vaccuming the stairs, painting trim, or, inevitably, portaging something both bulky and heavy. 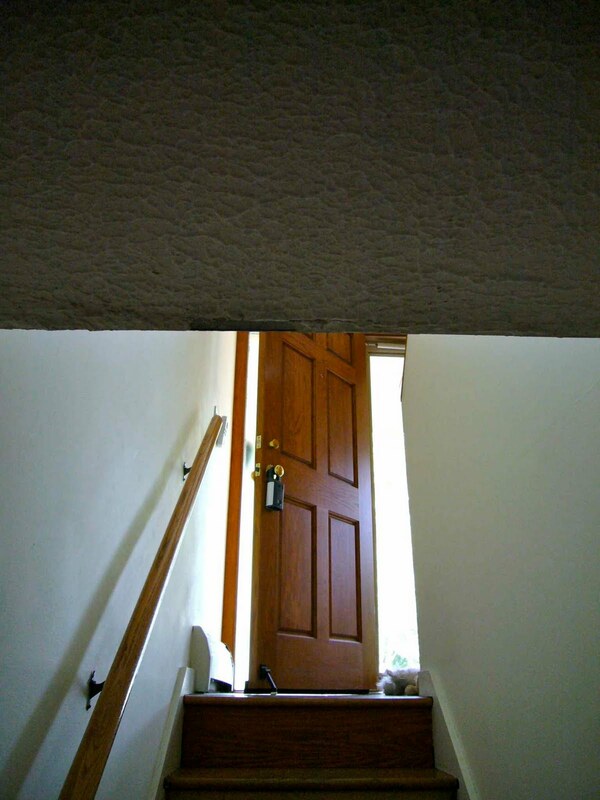 And while I'm still sad that I no longer call that house my home, I do have one happy head that's no longer inadvertently raining bits of plaster to the stairs below. Hey, my forehead recognizes that stairway!